Varanasi, also known as Banaras or Kashi, is a city on the banks of the Ganges in the Uttar Pradesh. 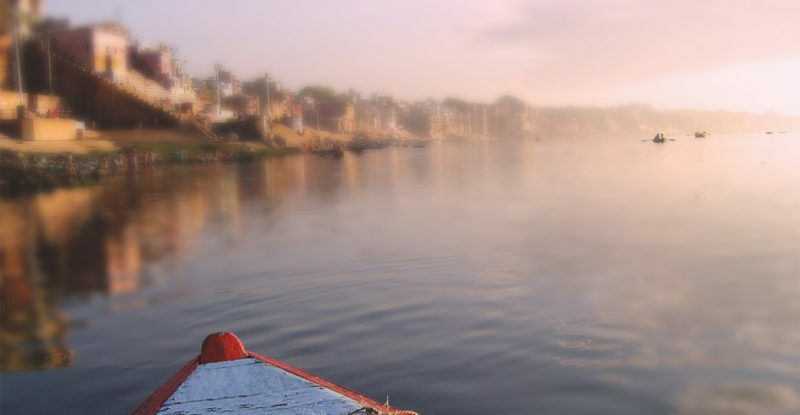 “Varanasi” finds its name from the geographic confluence of the two Ganges tributaries forming the city’s borders: Varun, still flowing in northern Varanasi, and Assi, today a small stream in the southern part of the city, near Assi Ghat. Before meeting Assi river at Varanasi, the Ganga river is joined by Gomti near Saidpur, Kaithi in Varanasi district. At the sangam of Gomti and Ganges, the famous Markandey Mahadeo temple is situated. About 100 kms from Varanasi, at Sirsa, Tamas river adds to the flow of Ganga. It is Tamas river, at the banks of which Rishi Valmiki ashram was situated where Sita mata came to live during the time of her exile. Luv and Kush, the sons of Lord Ram received education and were trained by Rishi Valmiki there. Many stories surround Varanasi. From the falling of Mata Sati’s earring at the Manikarnika Ghat to Lord Shiv punishing Lord Brahm – the land of Varanasi holds within itself a plethora of stories and beliefs. A cultural centre that has existed for several thousand years, Varanasi is the land that is also believed to bring salvation after death. The city is known worldwide for its many ghats, embankments made in steps of stone slabs along the river bank where pilgrims perform ritual ablutions. Of particular note are the Dashashwamedh Ghat, the Panchganga Ghat, the Manikarnika Ghat and the Harishchandra Ghat. Latter two ghats are noted sites to cremate dead and Hindu genealogy registers are maintained here. Historically, in the 8th century, Adi Shankaracharya established the worship of Shiv as an official sect of Varanasi. During the Muslim rule through middle ages, the city continued as an important centre of Hindu devotion, pilgrimage, mysticism and poetry which further contributed to its reputation as a centre of cultural importance and religious education. Tulsidas wrote his epic poem on Rama’s life called Ram Charitra Manas near Varanasi. Several other major figures of the Bhakti movement were born in Varanasi, including Kabir and Ravidas. Guru Nanak visited Varanasi for Maha Shivaratri in 1507, a trip that played a large role in the founding of Sikhism. In the 16th century, Varanasi experienced a cultural revival under the Mughal emperor Akbar who patronised the city, and built two large temples dedicated to Shiv and Vishnu, though much of modern Varanasi was built during the 18th century, by the Maratha and Brahmin kings. The Kingdom of Benares was given official status by the Mughals in 1737, and continued as a dynasty-governed area until Indian independence in 1947. Kashi Vishvanath Temple is one of the most famous Hindu temples dedicated to Lord Shiv. The temple stands on the western bank of the holy river Ganga, and is one of the twelve Jyotirlingas. The main deity is known by the name Vishvanatha or Vishveshvara meaning Ruler of The Universe. As per Shiv Purana, once Brahma and Vishnu had an argument in terms of supremacy of creation. To test them, Shiv pierced the three worlds as a huge endless pillar of light, the jyotirlinga. Vishnu and Brahma split their ways to downwards and upwards, respectively to find the end of the light in either directions. Brahma lied that he found out the end, while Vishnu conceded his defeat. Shiv appeared as a second pillar of light and cursed Brahma that he would have no place in ceremonies while Vishnu would be worshiped till the end of eternity. Sankat Mochan Hanuman Temple is one of the sacred temples dedicated to Hanuman ji. Established by Tulsidas in the southern part of Varanasi city, it is situated on the banks of Assi river. “Sankat Mochan” refers to Lord Hanuman as the reliever from troubles. Constructed in 18th century by Bengali Maharani, Durga Mandir (also known as Durga Kund Mandir, Durga Temple and monkey temple), is one of the most famous temples in Varanasi. Next to the temple, is a kund (pond) which was earlier connected to the river Ganges. It is believed that the existing icon of the goddess was not made by a man but appeared on its own in the temple. One of the oldest ghats in Varanasi, the Manikarnika Ghat is a shaktipeeth. It is believed that Lord Shiv entered Varanasi from this ghat after the death of Mata Sati. When Mata Sati sacrificed her life & set her body ablaze at the yagya of Raja Daksh Prajapati (one of the sons of Lord Brahma), Lord Shiv took her burning body to the Himalaya. On seeing the unending sorrow of Lord Shiv, Vishnu sent the Sudarshan chakra to cut the body into 51 parts which fell on earth. Every area where one of the parts fell are revered as shaktipeeths. At Manikarnika ghat, Mata Sati’s ear’s ornament had fallen. From here on, the Ganga continues its journey to the Ganga Sagar while still gaining strength from various other tributaries. Do check out the next issue to know about the culmination of this journey of Ganga as we know it. Varanasi is well connected with all major cities. The Lal Bahadur Shastri International Airport and the Varanasi Cantt Railway Station are amongst the busiest in the country and receive a large number of devotees and traders alike. It is also well connected by road with cities like Delhi, Agra, Kanpur, and Kolkata. Thank you for your constant support and appreciation. We would love to hear more from you! Share your views, opinions and ideas with us at tiw.writers@gmail.com. These will be shared on our website, www.theinnerworld.in. Selected entries will be published here.